Commercial air conditioners are as important as residential models during our hot and muggy Ohio summers. Indeed, in some ways, they might be even more important, since most people spent the heat of the day in an office, a retail store, a school building, or similar structure that requires commercial air conditioning. That system also needs to perform as expected day in and day out. When it doesn’t, you need a good service to take care of the issue quickly and effectively, without disruption. 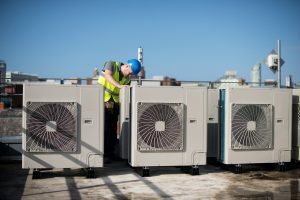 In most cases, modular rooftop air conditioning units make the ideal means of delivering cool air to your commercial space (as well as warm air in the winter in most cases). Modular units involve a series of identical HVAC units, each able to deliver a certain amount of cooling power. Why place them on the roof and why use modular units instead of a single AC? There are a number of good reasons, all of which provide key benefits to your office or business. How Do Rooftop Units Benefit My Commercial Space? Commercial HVAC systems have different needs than residential systems. They need to be more powerful, for starters, since they must heat and cool more space and support a comfortable environment for more people. They also carry bigger consequences when they suffer a breakdown, since an uncomfortable environment can lower productivity and drive customers away. Here in Rocky River, OH, a lot of businesses use rooftop units to heat and cool their business space. It gets around a lot of those issues and helps maintain the dependability that most commercial endeavors need. How? Here’s a quick breakdown. Posted in Commercial HVAC | Comments Off on How Do Rooftop Units Benefit My Commercial Space? If you own a business or work as an office manager here in Westlake, OH, you know that commercial HVAC systems have unique aspects to better enable them to meet the specified needs of the space. Commercial buildings aren’t the same as residential buildings, and while the principles of heating and air conditioning are unchanged, the methods used to deliver them need to reflect that. Many businesses opt to use modular units for their HVAC needs: multiple units, usually mounted on the roof, which each combine to deliver the heating and cooling for your building. You may ask yourself what the advantages of such a format are. We’ve provided three of them below. Westlake OH Heating and AC Question: Why Do I Need a Pool Dehumidification System? Too much humidity can be a big concern for Westlake pool owners. Humidity can cause damage to many structural areas, which can be costly to fix. In order to avoid this type of problem, it’s a good idea to install a pool dehumidification system. The dehumidification system alleviates any humidity problems, ensuring the structural aspects of the building remain intact and its integrity isn’t compromised. Pool dehumidifiers house big metal plates which are cooled off with refrigerant gases by a gas compressor. The metal plates prompt the moisture in the air to condense on them, and as the moisture slides off the plates it is gathered in a tray and pumped out. All pool dehumidifiers have a humidistat which can be set to regulate the humidity to the appropriate level for any given pool area. These systems can also help pool owners by heating the air around the pool. This is done in one of two ways. Either an electric heater is built into the humidification system or one can be attached to the regular heating system for the building. This helps to save electricity by using already warmed air. Pool dehumidification systems come in a variety of shapes and sizes to accommodate all types of pools. Installation by a trained Westlake HVAC professional is necessary to make sure the system is being installed properly and that it is in a position to provide the greatest benefit. They can be installed in a variety of places such as the rooftop or inside the pool area, depending on your individual situation. In order to make sure you get the right type of system for your pool, it’s a good idea to speak with the experienced professionals at Westland Heating and Air Conditioning. And after installation, it’s important to keep up with regular maintenance for your pool dehumidifier to ensure it continues to run smoothly. Posted in Indoor Air Quality | Comments Off on Westlake OH Heating and AC Question: Why Do I Need a Pool Dehumidification System? The primary function of cooling towers is the removal of heat from manufacturing and production processes. A cooling tower can work on simple principles of air conditioning or it could involve more complex processes such as those used in chemical plants, oil refineries or power plants in North Ridgeville . The size of a cooling tower is determined by the size of the process for which it is being used. While some cooling towers can be found in the form of small chimney-like structures, others can be the size of an entire office building. Regardless of their size, however, these structures are used to cool water and return it to an HVAC or related system for further use which saves a lot of energy as well as time and money. During the removal of heat, cooling towers either use air or the process of evaporation. When heat is removed using evaporation, the process of wet-bulb air temperature is used to measure the temperature of the air. On the other hand, when the temperature is taken by exposing water to cooler air, it is known as dry-bulb. Most of these cooling towers operate in pairs so if one system fails, the other one can take over. When air is used to cool the water in cooling towers, the water is directed towards the top of the tower. It is then made to follow a path that leads it to flow down in the form of droplets. When this happens, cool air is blown upwards against the water droplets. As the air passes these droplets, the temperature of the water drops and it is then returned to the bottom to be used further in the production process. When water is heated, it turns into vapor, rises up, cools and comes back down again as a liquid. This process is based on the natural phenomena of evaporation and condensation. The contrast of temperature between the water and the air is what determines the efficacy of this process. The larger the temperature gradient, the more efficient the process of cooling is. This is why humid regions are not great for this kind of cooling. While these processes can be either open circuit or closed circuit, many systems use both these types of circuits to maximize effectiveness. For more information about cooling towers or commercial HVAC in North Ridgeville, give Westland Heating and Air Conditioning a call today!